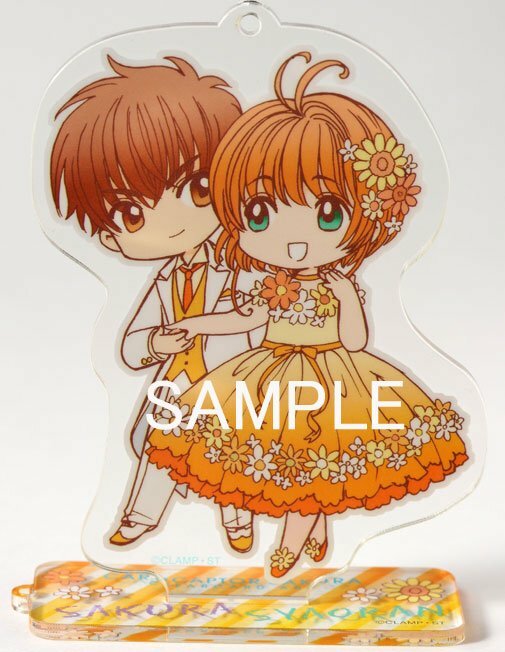 Acrylic stand keyholder drawn by CLAMP from Box 1. Kodansha will release a series of 4 Special Goods Boxes of Card Captor Sakura ~Clear Card arc~ from September to December, 2017. Box 1 – Release date: September 1st. Acrylic stand pannel to house the whole set of 4 acrylic stands. Box 2 – Release date: October 3rd. Box 3 – Release date: November 2nd. Box 4 – Release date: December 4th. Contents for each box are subject to change. Contents for boxes 2~4 will be announced as their release dates draw closer. Thank you for posting everything! I had some things wrong using only google translation: I didn’t get that the “panel” was something that could house all the stands, this is so nice!! This is very last minute for us fans, it’s one more thing added to an ocean of other CCS goods I had already planed to purchase, they are really making it hard on us with this timing ^^;; But even if I can’t own them right away, I’m still happy nonetheless to see items that are drawn by the original authors: new art is always welcome! I think the other boxes will be a little cheaper? Considering it won’t come with the Panel. But then again, they could fill them with other goods (other than a postcard and badge set). I hope the postcard will have new art, too! I will be in Japan when 2 out of the 4 boxes come out, which seems very tempting (you know, no shipping!). Oh yes, there would be import fees (which are worst than shipping). I’m still wondering myself whether I should buy it or not….